What is a plate exactly - to Carnival collectors, that is. "Place the piece in question on a flat, bare surface such as a wooden table . . . . . the distance from the surface of the table to the top edge of the plate should not be more than 2 inches at the very most . . . . . a plate is round or square. If it is oblong, one has a platter or tray." Another way to determine whether a piece is truly a plate is to turn it upside down onto the flat table. Virtually all parts of the edge should touch the table without any ruffling or crimping. A further proviso is that the angle of the sides of the item should be nearly straight - with no curve on the outer edge. Some plates are very flat, whilst others (typically those made by Northwood) tend to have more steeply sloped sides. The picture below compares the profile of a Northwood plate on the left, where the sides slope rather steeply, with a typical Fenton plate on the right which is much flatter. Dugan/Diamond plates vary and sometimes may even have a slight curvature to the sides, and Millersburg, perhaps surprisingly, made very few plates. Collar based plates can be very flat indeed - particularly ones made by Fenton and Imperial. Northwood's plates often have more steeply sloping sides, and in fact they may even go fractionally over the "magic" two inches, because of this. Some plates may be footed - and those feet may be spatula shaped (like the Fenton Dragon and Lotus plate above, right), scroll footed or even dome footed. In such cases the 2 inch rule will be overlooked if the plate is footed. Some patterns may be found in footed plates that were also made with either a collar base or with feet (for example, Fenton's Dragon and Lotus and Peacock and Grape). Is there such a thing as a "ruffled plate"? By its very definition (above), if a plate is turned upside down on a flat table, all parts of its edge should touch the table, without any ruffling or crimping. However, some ruffled bowls are very low and shallow and they fit within the two inch high rule. To help answer the question, perhaps we should also look at contemporary advertising and catalogues. Look at the Imperial catalogue from 1909, which illustrates such low ruffled bowls, like the one shown on the right (the pattern is exterior, called File). 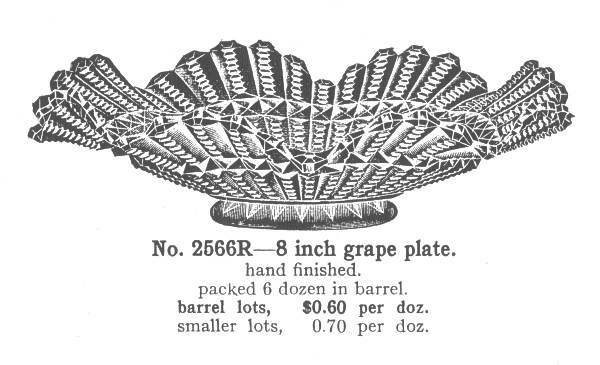 They are termed "grape plates" (presumably for serving bunches of grapes in). But debate rages about whether this low shape should really be called a plate at all. Does it matter and does it mislead collectors? It is impractical to try to start calling these pieces grape plates! However, it is also clear that the term "ruffled plate" is firmly part of the collector's vocabulary, and it would seem sensible to have a way to describe this shape. The term "ruffled plate" conjures up an image of the actual shape of an item, and provides a valid reference point. It also serves to distinguish this shape from the more conventional "true" plates, particularly as plates often command a premium in terms of collectibility, desirability (and price). Profile of the Imperial Grape "ruffled plate"
Several Carnival Glass items are regularly found as very low ruffled bowls and commonly referred to as "ruffled plates", including Imperial Grape (left), Imperial's Pansy, and Fenton's Ribbon tie (below). Fenton Ribbon Tie, low bowl, or "ruffled plate"